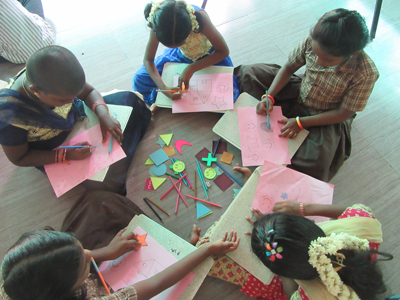 The SARVAM’S 10th Annual Summer Camp in the villages once again set new beautiful milestones. For almost three weeks, the presenters, organizers, volunteers and parents provided a happy and meaningful experience for over 800 children from SARVAM’S project villages. This year’s main focus of the camp—the centrality of media literacy in the programme—was particularly interesting to everyone. 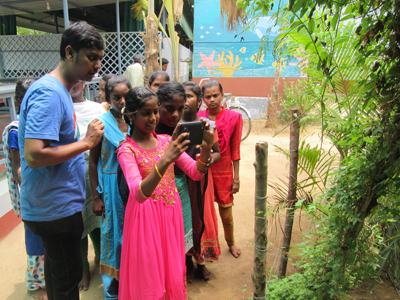 Many trainers truly appreciated the significance of village children conducting oral interviews, photographing and videotaping camp activities and village life, using computers for graphic design projects, creating digital animations through Movie Soup, and coding in Scratch. Especially exciting this year was the students’ work to learn about and create a website to showcase and share about the village over the years. This ambitious web project, undertaken as the sole focus of a group of 100 students during the camp, is the latest project in the eight years since the first computer lab opened. Each year, external organizations help organize workshops and activities. This year the children were treated to engaging science and engineering activities led by students from the Indian Institute of Technology, Tirupati. The Azim Premji Foundation again sent a group of facilitators who captivated the children’s attention with hands-on science and math experiments and classes in language and social skills. As usual, Chinmaya Mission focused on character building classes effectively. As always, the children were fascinated and engaged by these programmes that complimented the usual offerings of craft, art, dance, storytelling, yoga, martial arts and sports and field trips. The Summer Camp for 800 children simultaneously held in five villages would not have been possible without the organization and hard work of the village women who prepared and served the snacks and meals, the support of the senior students themselves who kept the Camp clean and enthusiastically helped with countless other chores and tasks, and the dedicated coordinators and volunteers. Their efforts over the years are what built such a successful programme and earned the growing reputations that this year even caught the eye of the Honourable Governor of Tamil Nadu, Shri Banwarilal Purohit. SARVAM organizers, workshop leaders and students were pleased with the unexpected visit of the Governor of Tamil Nadu. Amidst great fanfare and media attention, he spent over an hour witnessing an otherwise normal day at the Camp. During his observation of hundreds of children eagerly participating in a multitude of engaging programmes, he was particularly impressed to see a demonstration of the coding abilities of a young student building a Scratch project and to hear a girl deliver a speech in English about the media literacy theme of this year’s camp. But as usual the real success is measured by the responses of the children. Many of the visitors remarked that they had never seen this level of discipline, engagement and bliss among rural children. With the motivation and support they receive through programmes such as the SARVAM Summer Camp, many of the students will actually be able to realize their dreams.